In April, Daniel Colman emerged onto the live poker scene, defeating Dan Cates heads up in the European Poker Tour Grand Final Super High Roller for over $2.1 million. Now, a little over five weeks later, he’s banked several more million dollars, defeating Daniel Negreanu heads up to win the $1 Million BIG ONE for ONE DROP and $15,306,668. Colman, known better as heads-up sit-n-go specialist “mrgr33n13,” battled Negreanu for 46 hands before the two played an epic all-in pot to end the tournament. 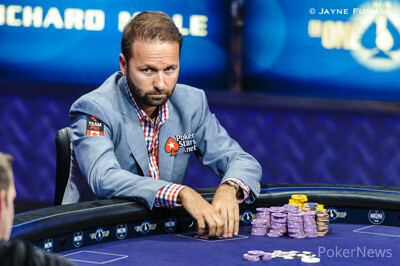 All of the money went in the middle preflop, and Negreanu was ahead holding ace-four against the king-queen of Colman. Negreanu flopped two pair, and his rail was chanting for a four to fall on the turn to fill him up, but the turn was a ten, giving Colman Broadway. The river did not give Negreanu a full house, and he was eliminated. 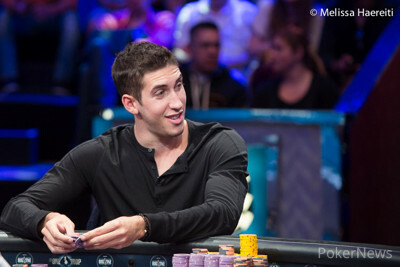 This is Kid Poker’s second runner-up finish at the 2014 WSOP — he finished second to Paul Volpe in Event #13: $10,000 No-Limit 2-7 Draw Lowball Championship — but the $8,288,001 he earned is the largest score of his career. He is also now the all-time live tournament money earner, edging the inaugural ONE DROP winner, Antonio Esfandiari, out by three million dollars. 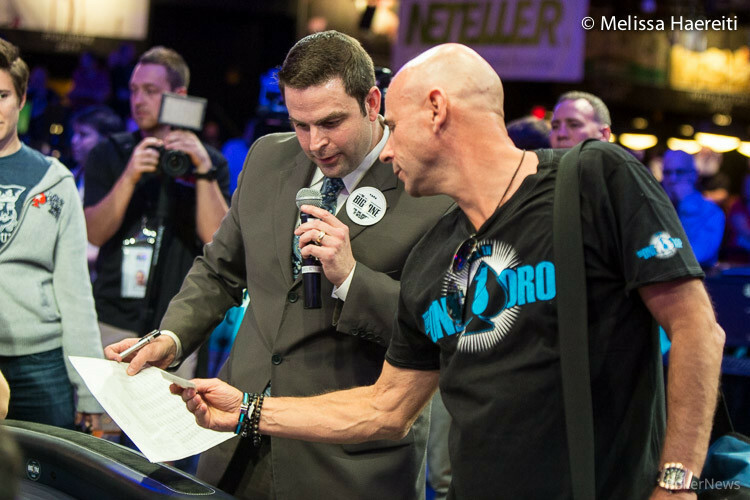 Day 3 of this tournament kicked off with a nine-handed unofficial final table led by Rick Salomon, and on the very first hand “Hong Kong” Tom Hall burst the $1.3 million bubble. He lost a race to Negreanu, allowing Paul Newey to squeak into the money with just six big blinds, and Newey proceeded to double up twice. This allowed him to outlast Cary Katz, who ran pocket eights into Negreanu’s pocket jacks, and exited in eighth place. Newey met his maker a few orbits later after being crippled by Tobias Reinkemeier, earning over $1.4 million for his efforts. Reinkemeier was then crippled by Colman, who doubled with pocket aces against the German’s pocket fives, but Scott Seiver was the next player to be eliminated. With Reinkemeier sitting on less than two big blinds, Seiver called all in with a pair and a flush draw on a flop against Negreanu. Negreanu had top pair and held as the turn and river produced bricks. Reinkemeier exited four hands later when Negreanu flopped a flush against his middle pair. The very next hand Salomon lost a flip against Colman, busting in fourth place. Christoph Vogelsang, Negreanu, and Colman battled for 32 hands — Vogelsang never emerged from third in chips — and the German was busted in third place. His three-big blind shove was called by both Negreanu and Colman, and the former won with two pair. The heads-up match swung back and forth at the start, but Colman eventually pulled away before the final, epic battle. Thank you for following our coverage of this historic event, and congratulations to Colman on winning over $15.3 million and a custom-made bracelet from French designer Richard Mille. We urge you to continue refreshing your browser on PokerNews for the next few weeks as we bring you unmatched coverage of the grand daddy of them all: The Main Event! Hand #114: Daniel Negreanu called on the button and Daniel Colman checked his option. The flop came down and both players checked. The hit the turn and two more checks allowed the board to complete with the . Negreanu showed and Colman tabled , meaning this hand would be a chop. Hand #115: Colman opened to 3.2 million from the button and Negreanu folded his big blind. Hand #116: Negreanu called from the button and Colman checked. The flop came down and Colman checked. Negreanu fired 2.5 million and Colman stuck around. The turn was the and both players checked. The completed the board and both players checked. Negreanu showed and Colman tabled . The players chopped the pot. Hand #117: Colman opened to 3.2 million and Negreanu folded his big blind. Hand #118: Negreanu limped the button and Colman made it four million to go. Negreanu shipped all-in over the top for 20.85 million and Colman instantly called. The flop came down in dramatic fashion with hitting the felt and giving Negreanu two pair of aces and fours. Colman was not dead though, as he also hit the flop for an inside straight draw to Broadway. The dealer rapped the table and produced the turn card. The ESPN stage erupted with cheers as Colman suddenly took the lead with a straight. Suddenly, it was Negreanu who was looking for help with just one card to come. Negreanu needed an ace or a four on the river to make a full house and stay alive. Unfortunately for "KidPoker", the peeled off on the river and he was eliminated as the runner-up for $8,288,001 in prize money. Hand #111: Daniel Colman limped in on the button, Daniel Negreanu raised to 5.6 million, Colman called, and the flop came . Negreanu checked, Colman bet four million, and Negreanu called. 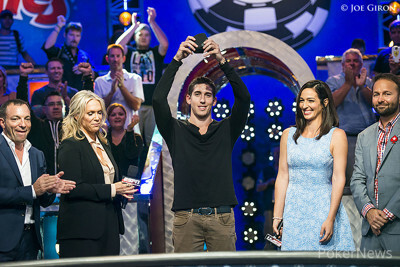 The turn was the , Negreanu checked again, and Colman won the pot with a bet of eight million. Hand #112: Negreanu called with the button, Colman raised to four million, and Negreanu called. The flop fell , both players checked, and the turn was the . Colman led out for five million, and Negreanu folded. Colman showed for a set of jacks. Hand #113: Colman limped in on the button, Negreanu checked, and the flop fell . Negreanu led out for two million, Colman called, and the turn was the . Negreanu led out again - this time for 4.5 million - and Colman folded. Hand #107: Daniel Colman completed from the button and Daniel Negreanu checked. The flop came and Negreanu checked. Colman fired 2 million and Negreanu let it go. Hand #108: Negreanu opened to 3.2 million from the button and Colman folded his cards. Hand #109: Colman opened to 3.2 million from the button and Negreanu called to see a flop. The dealer fanned on the felt and Negreanu checked to the raiser. Colman continued out for 3.25 million only to have Negreanu ship all in over the top for 26.6 million. Colman quickly folded and Negreanu took the pot. Hand #110: Negreanu called from the button and Colman made it 5.6 million total from the big blind. Negreanu folded and Colman was pushed the pot. The players are on a 20-minute break. Hand #104: Daniel Negreanu opened to 2.5 million from the button. Daniel Colman called and the flop came . Colman check-folded to a 2.5 million continuation bet from Negreanu. Hand #105: Colman raised to 2.5 million and Negreanu called from the big blind. The flop was and Negreanu checked. Colman fired 2.5 million and Negreanu stuck around to see fourth street. The dealer produced the on the turn and Negreanu checked for a second time. Colman bet seven million and Negreanu let it go. Hand #106: Negreanu popped it up to 2.5 million from his button and Colman came over the top for 7.5 million. Negreanu thought for about 30 seconds before sliding out a call. The flop came down and Colman continued for 7.5 million. Negreanu let his cards go and Colman was pushed the pot.